Classification: Phylum: Arthropoda, Class: Insecta, Order: Coleoptera, Superfamily: Curculionoidea, Family: Attelabidae, Genus: Trachelophorus. Size: The total body length of the males is just under an inch (2.5 cm), among the longest for any Attelabid species. Lifespan: Variable, from days to a year. Habitat: The forest undergrowth of Madagascar. Adaptations/Unique Facts: Indemic to Madagascar, it derives its name from an extended neck much like that of the common giraffe. The extended neck is an adaptation that assists in nest building. Reproduction: When it comes time to breed the father-to-be will roll and secure a leaf of the host plant, Dichaetanthera cordifolia (a small tree in the family Melastomataceae), at which point the female will lay a single egg within the tube. 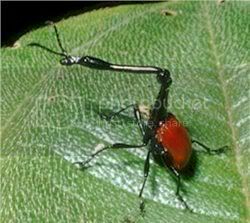 Other: Another beetle with a similar name is the New Zealand giraffe weevil, Lasiorynchus barbicornis. 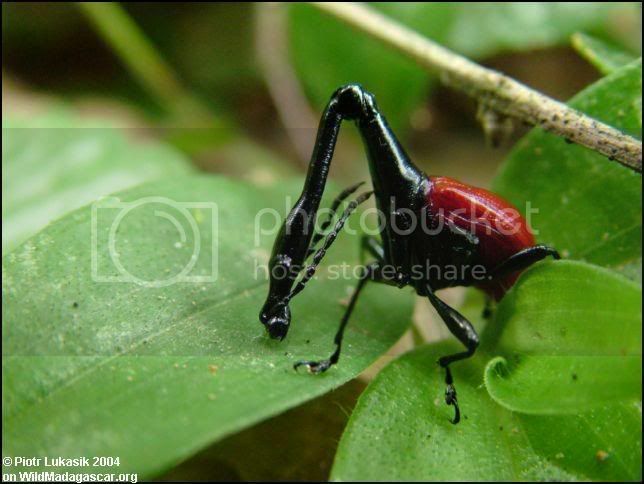 This is the longest weevil in the world, and is from the family Brentidae. 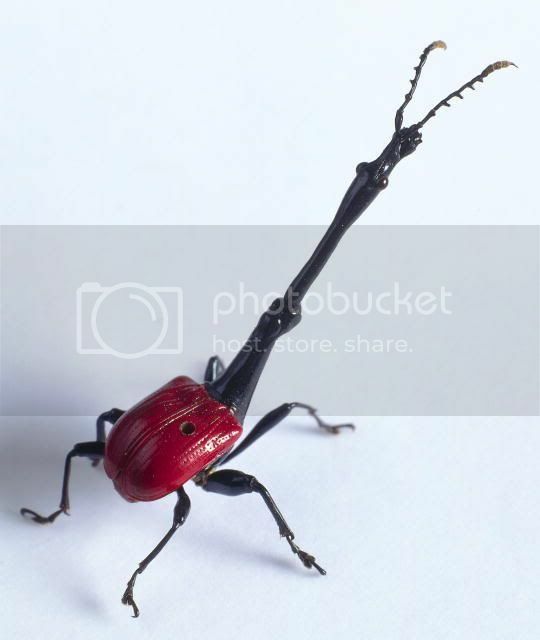 Due to the shape of their heads, weevils are commonly known as snout beetles. Awww! Weevils in general are one of my favourites, but this is too too adorable.